Bring a little shade to your business with the Galtech 3.5 x 7-ft. Commercial Half Wall Aluminum Market Umbrella. This quaint patio umbrella is designed with style and simplicity to meet the demands of your commercial application - or for real peace of mind using it season after season at home. A seamless threaded coupling gives this umbrella a sleek appearance, yet its two-piece assembly means it can be stored easily. A durable resin hub and runner are capable of handling years of use. The simple push-up lift is easy to raise, and a pin locks the canopy in position. 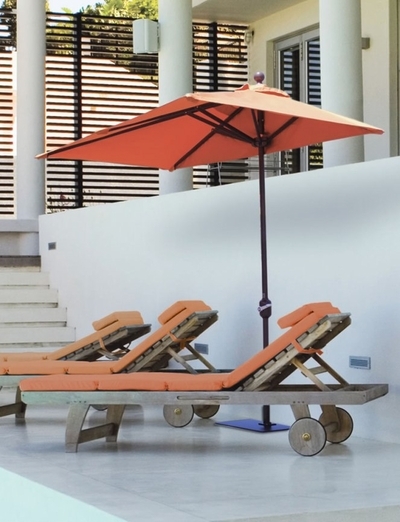 This umbrella features fiberglass ribs, which allow for more flexibility. Fiberglass ribs are less likely to break if the umbrella should tip over and will stand up better to extremely windy conditions. This is a must have final piece for your commercial patio space giving your open-air environment that superb touch of flair. * Shade Size: 3.5' x 7' ft.